Photo courtesy of Isabelle Charest's official Twitter page (@IsabelleCharest). Quebec's newly appointed Minister of Status of Women Isabelle Charest is facing backlash after saying the Muslim headscarf for women is a "symbol of oppression". Speaking to reporters Tuesday, Charest said the headscarf "is not something that women should be wearing." The minister said she respected the women who chose to wear a headscarf, but added, "When they are dictated by a religion on what they have to wear, for me it's a lack of liberty, and it doesn't meet my values." The National Council of Canadian Muslims (NCCM)'s Montreal representative Razia Hamidi said a minister whose task is solving women's problems should act more responsibly. "Given the current climate in Quebec, [her comments are] really problematic and dangerous. There is no room for the government in a woman's closet," Hamidi stressed. "Women are free when they express themselves in the way they want to, but when they are judged because of their choices they suffer." Amira Elghawaby, an Ottawa-based human rights advocate, said Charest's comments were disappointing and could be harmful to Muslim women. "Whenever we see political officials begin to talk in a way that gives credence to an idea that Muslim women should be treated as second-class citizens, that we don't have the capacity to think for ourselves, can't make our own decisions and need the state to tell us what's suitable dress, that's very dangerous," said Elghawaby, who wears a hijab. "It sends the signal to the broader population that we don't deserve respect, don't deserve to be treated with dignity and that we don't deserve the same freedoms everyone else enjoys." Canada's Minister of International Development Marie-Claude Bibeau also criticized Charest for her comments, reminding her that women have the right to choose "what they do with their body and how to dress." 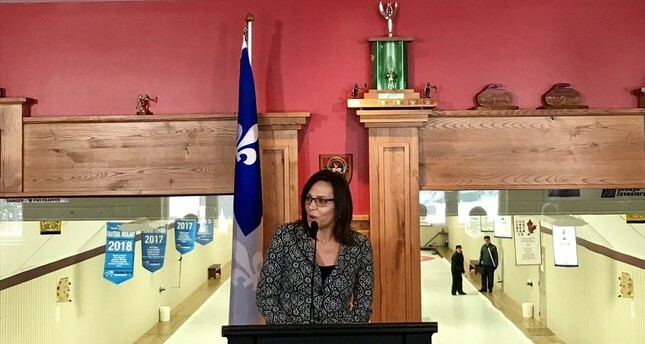 Quebec opposition politicians called the Canadian state minister's remarks "divisive" and "clumsy." The right-wing Coalition Avenir Québec (CAQ) party is planning to introduce a bill banning public workers in positions of authority from wearing visible religious symbols, including the headscarf. Quebec is home to a large Muslim population estimated to be 243,000. In January 2017, 29-year-old Alexandre Bissonnette burst into the Quebec City mosque and unleashed a hail of bullets on the 40 men and four children who were chatting among themselves after evening prayers. Six people were killed and five others were seriously injured, one of whom is now quadriplegic.